This method should be used when you are required to remove all data associated with an employee, including all of the individual movements they may have had (if you are using Employee In/Out). Example use case: An Employee has left your business and you wish to remove all personal information about them from SwipedOn. To anonymize an employee, you firstly need to Archive the employee. You then Anonymize from the Archive. You can only archive a Signed-Out employee. You will firstly need to Archive the employee. Navigate to the Employees tab on the left side of the screen and click on the Archive tab, then select the employee you wish to anonymize. 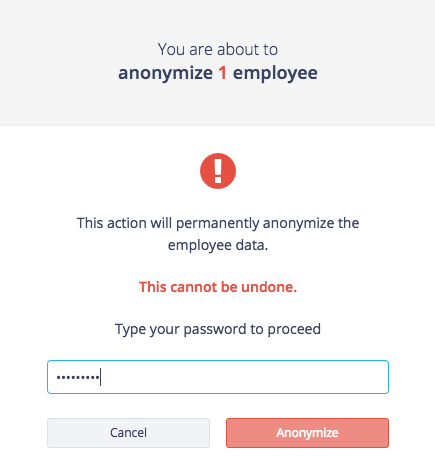 You have now anonymized an employee! *Please note once an employee has been anonymized, the anonymized data cannot be recovered.